There is a little confusion about the current status of events that will take place to try and shut off the oil flow into the Gulf. 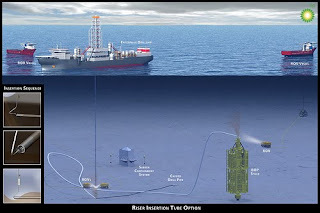 At the present time it appears that the first line of attack is going to be a tube that will be inserted into the riser, capturing all the hydrocarbons, and feeding them to the surface. The intent in trying this route first is that it captures the fluids before they mix with seawater, and thus will prevent the formation of the methane hydrates that were a problem with the first containment box. Should the pipe insertion not work, the “top hat” is sitting on the ocean bed near the site, ready to be deployed. The pipe is being inserted at the leak that is creating about 85% of the flow into the Gulf and could start siphoning oil as early as this evening. At the present the next alternative to this is planned to be the “junk shot.” After taking a gamma ray scan of the BOP, there is a path to get the bulk particles (golf balls, bits of tire etc) into the well below the BOP where they will fill most of the voids in the flow path, and hopefully slow the fluid flow to the point that a counter-flowing feed can be introduced that will weight up the hole, and then stop the flow. It is expected that this will be tried, regardless of the pipe insertion success, some time next week, since it will effectively kill the well. Because the pipe that is being inserted into the riser won’t be a perfect fit for the pipe it is going into, there has to be some form of seal to make sure that the oil and gas flows into it. This planned seal is based on the use of rubber flaps. The 6-inch insertion tube is intended to rest inside the 21-inch riser pipe, surrounded by rubber flaps meant to prevent more oil from pouring out. The tube would carry the oil to a tanker on the surface. Proegler described the procedure as a stopgap measure. I have mentioned that specifically because there has been a lot of conjecture on how much fluid is flowing out of the riser, and what pressure that it is at. The condition of the BOP seems to suggest that the flow through it is still acting as an orifice that resists most of the driving pressure from the reservoir, that is moving the oil and gas into the well. By relying on rubber flaps, BP seem to accept that there is little additional pressure in the fluid beyond that point (which is somewhat evident by the behavior of the fluid leaking from the well as shown in the video) It is the size of the flowing orifice, and the velocity of the flow that has given rise to some of the recent higher predictions of oil leakage which have reached up to 70,000 bd. While the velocity of the flow can, to a degree, be point estimated using particle image velocimetry, the ability to average that over the whole flow, and the actual size of the orifice (it is leaking through a crack in the riser) makes the orifice estimation more of a guess, as is that of the total flow volume. I suspect that once the flow is captured then the actual flow will be reported, and will come in closer to the BP estimate, which remains about 5,000 bd, and remains much lower than the more recent estimated values. Daily update news about real estate, real estate in vietnam, vietnam real estate. Welcome to my blog and feel free to comment your thoughts!! !